Our practice’s main focus since day one has always been on prevention. Why? Because it’s much better for your oral health if we help you avoid dental issues rather than simply fix them as they pop up. Plus, this approach will also help you save time, money, and unnecessary discomfort. With our thorough checkups, cleanings, and more, we’ll make sure you and your entire family have a lifetime of healthy smiles. 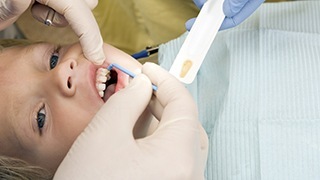 Everything at Ridgepointe Dental starts with the standard checkup and cleaning. 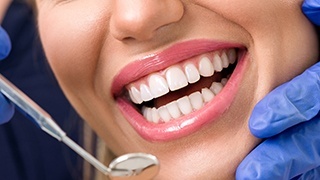 At these preventive appointments, one of our excellent hygienists will use ultrasonic instruments to break up and clear away plaque from your teeth and gums, and then your dentist will perform an oral exam and oral cancer screening, so he can identify problems early and treat them quickly. Together we can make sure you always have a clean, strong, and healthy smile. The chewing surfaces of the back teeth are one of the most common areas for cavities to develop, especially for children. To give these teeth extra protection right where they really need it, we can apply a thin, layer of plastic resin to create a dental sealant. This will prevent plaque and food particles from accumulating on the enamel, which will effectively prevent tooth decay. Do you ever wake up in the morning with a stiff or sore jaw? 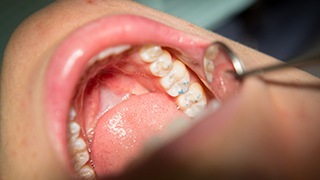 If so, you could be suffering from nighttime teeth grinding or clenching, also called bruxism. Over time, this can strain your sensitive jaw muscles and even cause your teeth to break and fracture! 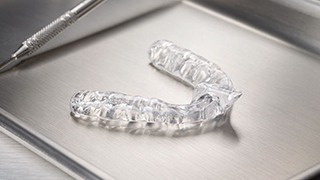 To help you sleep easy, we can provide you with a custom-made mouthpiece called a nightguard. It will fit comfortably over your teeth and establish a barrier between them to prevent any damage from unconscious grinding or clenching. Nearly 50,000 people will be diagnosed with oral cancer this year alone, and the best way to ensure successful treatment is with early detection, which is why the American Cancer Society recommends that everyone should have an oral cancer screening at least once a year. We perform one during your regular checkup, and if needed we will use the VELScope light, which will allow us to see potentially cancerous tissues that normally would be hidden to the naked eye. Fluoride is a natural mineral that helps strengthen the teeth against tooth decay, and often, people are able to get it naturally through their diet. However, thanks to the increased popularity of bottled and filtered water, more people are missing out on it, which can make their teeth more vulnerable. In-office and at-home fluoride treatments can help prevent decay and combat tooth sensitivity. 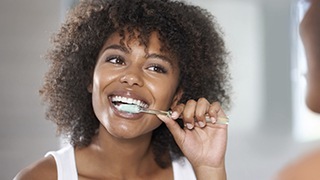 Most dental care actually occurs in the home with routine brushing and flossing, so the products you use are extremely important to your long-term dental health. Should you need a recommendation about which products would be best for you, you can always ask us! We can discuss with you which of the most popular over the counter brands that would be best for you and even offer specialty items like Prevident 5000, which has prescription strength fluoride. 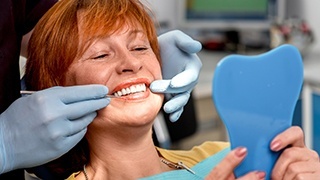 At Ridgepointe Dental, taking care of your smile starts with prevention, and all it takes is two easy appointments each year to make sure you and your family will be smiling for decades to come. If you have any questions about our preventive services, or if you’d like to schedule an appointment, please contact us today.